Rule: The TERMINATION begins on the fourth or fifth syllable before the end of the verse. 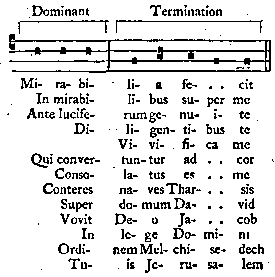 The syllable immediately following is sung to the Podatus, SOL-LJy the next syllable is sung to the note SOL, which is never repeated; and if the Termination begins on the fourth syllable, the last syllable is sung to one note FA\ but, if the Termination begins on the fifth syllable, the last two syllables are each sung to FA. The Termination begins on the fifth sylla�ble in the exceptional cases mentioned in the Rule for the Terminations of the Fourth Tone.